Here’s everything you need to know, transit-wise, about this Sunday’s Bay to Breakers. If you still don’t have your costume ready, you can dress up like Muni! Runners and walkers will start the route at Howard at Main streets in SoMa before setting off to traverse the iconic Hayes Street Hill and Golden Gate Park to Ocean Beach. Pre-Race Service: Extra service will begin at 6 a.m. in the Muni Metro subway and on the NX Express, 5R Fulton Rapid, 38R Geary Rapid and the N Judah..
Post-Race Service: From 8 a.m. to 2 p.m., extra service will be provided on the N Judah Line and the NX Express, 5X Fulton Express, 7 Haight/Noriega and 29 Sunset routes. 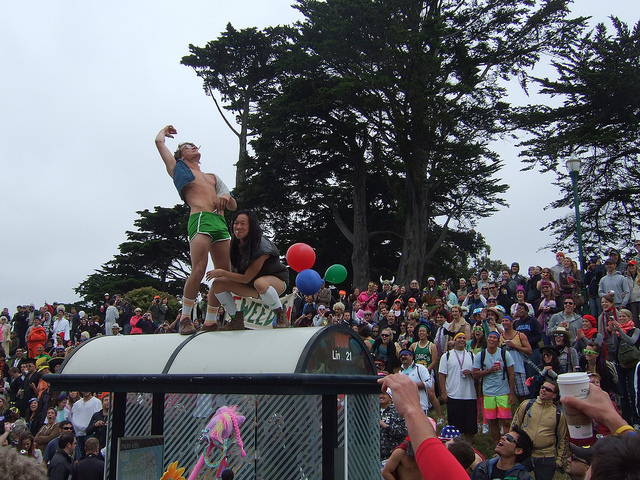 For complete details on extra service, please visit our Bay to Breakers Express Service page. Major traffic and Muni impacts across the city on Sunday will start as early as 5 a.m. and end as late as 4 p.m. For full details, please visit our Bay to Breakers Service Alert page. Sunday morning and afternoon: Numerous Muni routes will be rerouted for the race across the city. For full details, please see the Transit Impacts section of our Bay to Breakers Service Alert page. Starting Saturday at 6 p.m.: Due to event setup, there will also be reroutes near the start and finish lines on the 5, 7, 18, 25 and 38/38R routes. For region-wide Bay to Breakers transportation information, please visit our partner transit agencies’ websites: BART, SamTrans, Caltrain, Golden Gate Ferry, AC Transit as well as 511.